Stunning large format map of Virginia, Maryland, and Delaware. Viginia Maryland Delaware By H.S. Tanner. 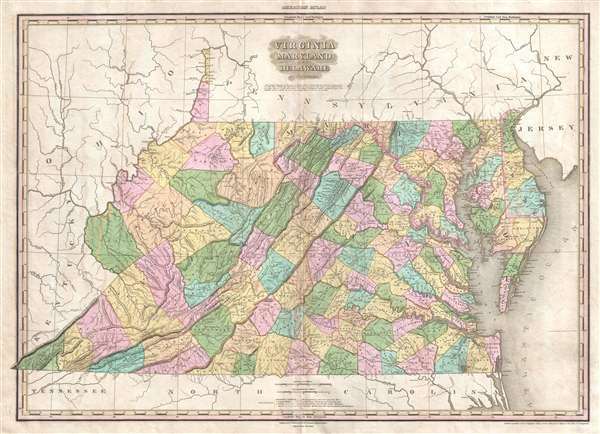 A rare and important map of Virginia (and West Virginia), Maryland and Delaware by H. S. Tanner. This elephant folio map covers these states in full as well as, in less detail, parts of adjacent states. The map shows rivers, topography by hachure, cities, towns and roadways. Predates the 1863 separation of Virginia from West Virginia. The present example is the scarce 2nd edition from 1825. This map was published in the 1825 edition of Tanner's iconic New American Atlas. This map, like all maps from the New American Atlas, is today rarely seen on the market. Very good. Small light transferrence here and there. Light creasing along centerfold. Little foxing along margins. Staining along centerfold on verso.